Wading through all of the printers on the market can make finding a great printer difficult. Even more so, perhaps, when you need one for the home office. Home office printers typically need to produce better quality and higher output than a printer for a typical home user. 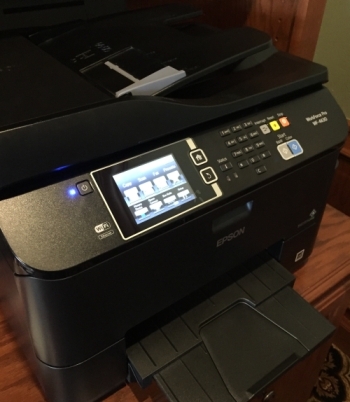 In my opinion, the Epson WorkForce Pro WF-4630 is an outstanding All-In-One option for the home office. It retails for approximately $199. The specifications from the Epson website are listed below, but I especially like the print quality and the relatively low printing cost. Additionally, the WiFi Direct printing for tablets and smartphones actually works, which is not always the case with printers who claim this feature. The rear tray can easily handle photo paper and high-quality envelope paper without jamming. Scanning preset options make scanning to the computer more efficient. Lastly, I love the “intuitive” nature of the printer. If the paper size or type for your print job is different than what is loaded or expected by the printer you will be prompted on the screen with a question on how to handle it rather than having to start the print job over.